She's recently been very interested in my sunglasses and if she's in arms reach she'll take them off me, try to put them back on, will put them on herself (usually they fall around her neck and she sits there very proud of herself), and generally just like to hold them. 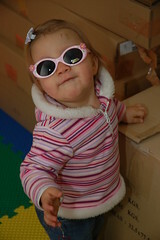 Today she got her very own pair, and she was too cute coming home, wearing her sunglasses! When I put them on, she didn't move her hands for a while, as if it would go away if she moved at all. Then she would pull them down slightly on her tiny little nose and look over them... then push them back up. She kept them on until her nap.